Milan was not what I expected. It could perhaps have been any other large European city, like Lyon, I thought. Lots of migrant beggars plying their trade at the traffic lights, graffiti everywhere and a city that instead of presenting a sense of high fashion among the population, looked as if it needed lots of money to smarten a faded and weary-looking image. Times are visibly tough in Italy and Milan looked it from the inside of my taxi and Silvio Berlusconi is back as President. It’s rather like re-electing Tony Blair in my eyes! 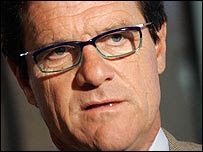 My fellow passenger on Alitalia was none other than England Football Manager, Fabio Capello. No I thought that millionaire football managers used private jet but Fabio is obviously a prudent man and economy class on the Italian state airline is good enough for him. The flight proceeded uneventfully until a couple of England fans recognised him and first a woman traipsed up and asked for his autograph and then the man who was with her. Personal privacy obviously mean very little to both of them. Worse was to follow at Heathrow, when by coincidence, we ended up next to each other in the immigration queue. By now, lots of people had noticed that it was “Fabio” and the mobile phone cameras and videos were starting to be pointed in our direction, with people coming out of the woodwork to stand next to him and ask for their photo to be taken. Other than my own personal space being invaded by strangers, I felt very sorry for the man. There was a time when the English, at least, wouldn’t act in this way but no more. It was embarrassing and the immigration officers were starting to warn people not to use their cameras at passport control. It could have been worse I suppose. Imagine if it had been David Beckham instead!